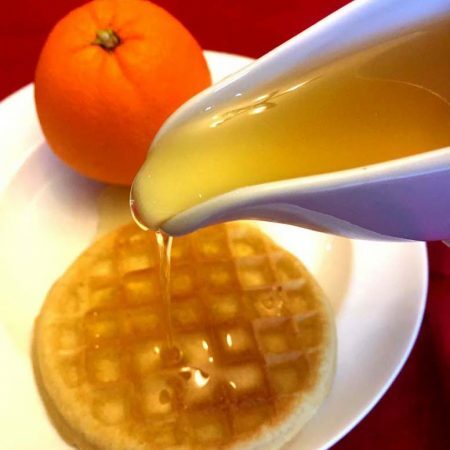 This homemade orange syrup is amazing! It will take your pancake breakfast to the whole new level! You can also use it to sweeten your drinks! Making the orange flavored sugar syrup is super easy. All you need to do is boil the orange peels with sugar and water! Scrape off the white pith from the orange peels before using them for this recipe, as the white stuff is bitter. What you need is the orange zest part of the orange peel, as that’s what will give your syrup an amazing orange flavor! 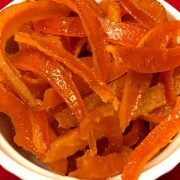 If you go to my candied orange peels recipe, you will notice that I used my Instant Pot to make them. 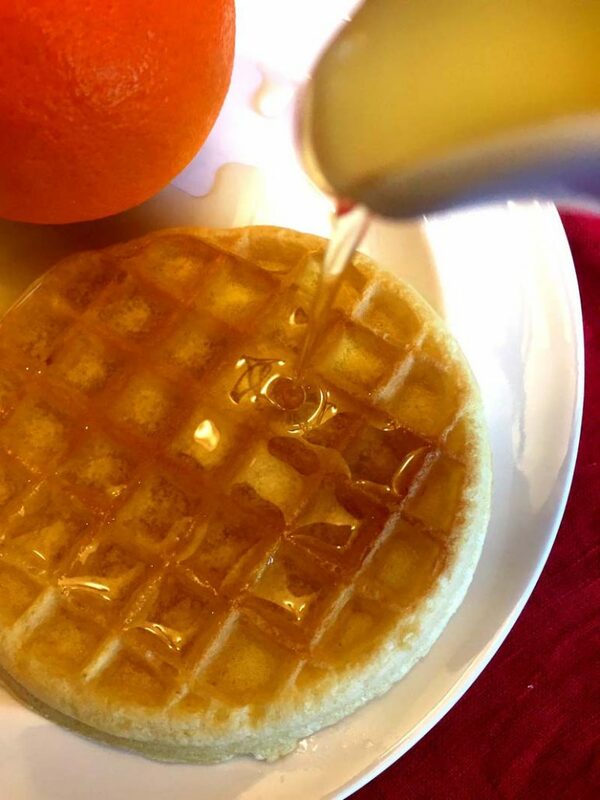 The directions for orange syrup below are for the stove top version (no Instant Pot needed). 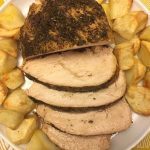 If you own an Instant Pot, then certainly use it, as it makes your life easier (just pressure cook all the ingredients for 20 minutes on High pressure). 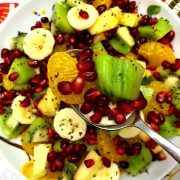 If you don’t have Instant Pot, follow the recipe card on the bottom of this article as written – simmer the orange peels, sugar and water for 30 minutes in a saucepan. 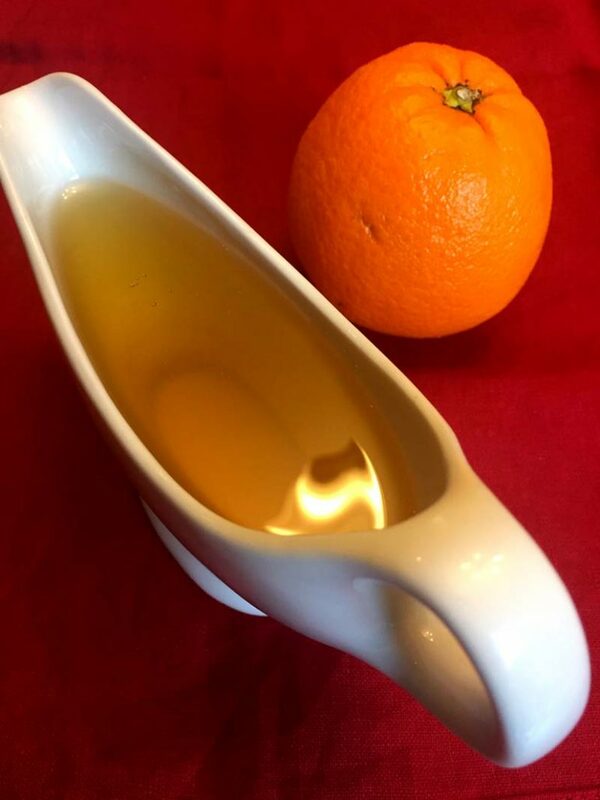 This orange sugar syrup uses 2:1 sugar to water ratio (2 cups sugar, 1 cup water). 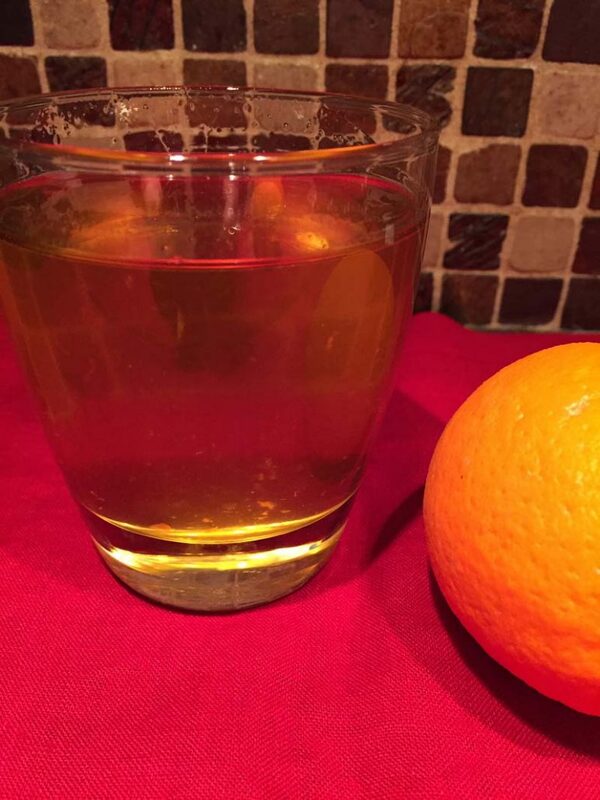 If you are going to use it in cocktails recipes and want it to be a true simple syrup (1:1 sugar to water ratio), simply stir in 1 additional cup of water after you remove the orange peels. For pancakes, 2:1 ratio is better as the syrup will be thicker (and it will thicken more in a refrigerator once it cools down). 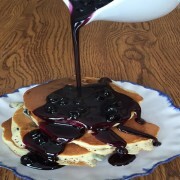 Homemade Blueberry Syrup – made with real blueberries, this homemade syrup is simply amazing with pancakes or ice cream! 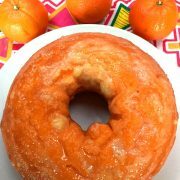 Orange Bundt Cake – this homemade orange bundt cake is super moist and full of orange flavor! Great to give as a homemade food gift too! Cranberry Orange Bread – this is a perfect holiday loaf made with real cranberries! You can taste the orange in every bite! Cranberry Orange Sauce – make this homemade cranberry orange sauce with just 2 ingredients – cranberries and orange juice concentrate! Homemade Orange Chicken – who needs a Chinese takeout when you can make this orange chicken yourself! 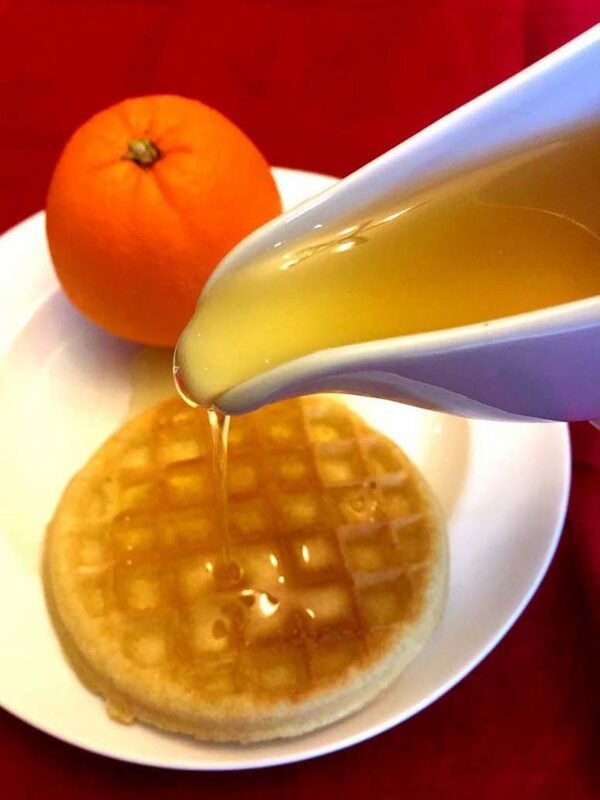 This homemade orange syrup is amazing! So sweet with deep orange flavor, it turns any plain pancakes into a feast! You can also use it to sweeten your drinks! Remove as much white pith from the orange peels as possible and discard (as white pith has a bitter taste, so you only want to use the orange part of the peel). Add water, sugar and orange peels to a saucepan and bring to boil. Strain out the orange syrup and refrigerate. 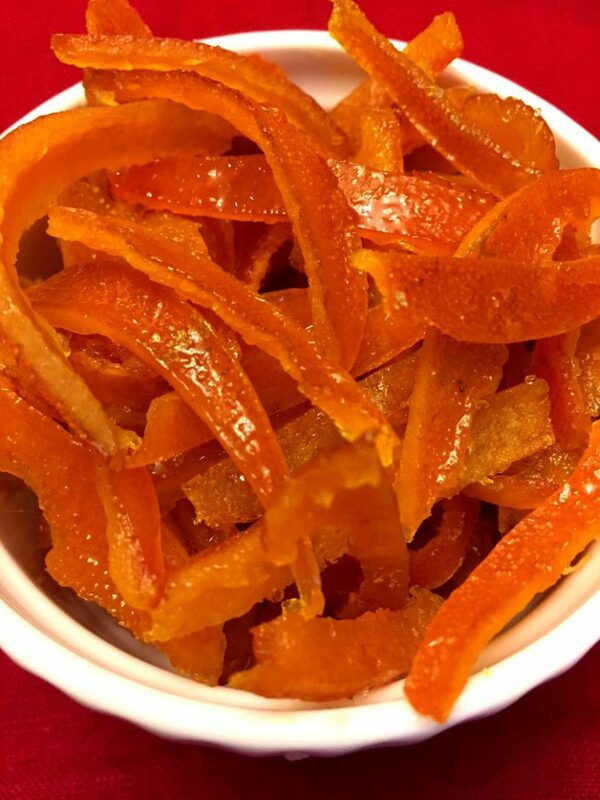 The orange peels can also be eaten (they turn into candied orange peels, you can lay them out on a parchment-paper-lined baking sheet and bake in 200F oven for 30 minutes to dry them out). The orange syrup will thicken as it cools. It can be kept in a refrigerator for up to 1 month. 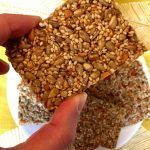 You can also make this recipe in the Instant Pot: put orange peels, sugar and water in the Instant Pot and pressure cook on High pressure for 20 minutes.